Yorktown, Va. – Betty Lou Dunston Kopczynski passed away on Tuesday, March 26, 2019. Betty Lou was 81 years old and a lifelong resident of York County and the only child of Edgar and Oneida Dunston. She was a proud member of the first graduating class at York High School. While initially having worked for the Yorktown Naval Weapons Station (Naval Mine Depot at the time), she later began working for the medical offices of Yorktown Family Practice. Eventually, Betty Lou became the nurse for Dr. Hawes Campbell III and served in that capacity for many decades until her retirement. Through her work for Yorktown Family Practice, she helped care for many patients from York County, as well as surrounding communities. During her many years of marriage to Vincent “Ski” Kopczynski, they were both blessed with many friends and acquaintances. 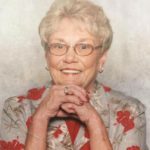 Betty Lou was known for her love of family, her caring attitude and dedication to both her church and community. This was demonstrated in many ways including serving as a greeter at Crooks Memorial United Methodist Church, volunteering for the York County Fire and Rescue Service, as well as a participating member of Beta Sigma Phi Sorority, among many other endeavors. She loved making crafts and often could be seen at various craft shows throughout the area. Betty Lou was pre-deceased by her parents and her loving husband of 39 years, Vincent Paul “Ski” Kopczynski. After “Ski’s” death, she stayed active in many ways as part of her involvement throughout the community and watching her family grow. She was always so proud of the accomplishments of her three sons, her grandchildren and great grandchild. She was also pre-deceased by her caring and compassionate grandson, Hobie Dunston Kopczynski. She is survived by her three sons and their families including: Steve, his wife Julie and their children, Hunter Kopczynski and Haley (Jimmy) Stevenson, as well as great grandson Weston Stevenson; Robbie and his daughter, Kristen Kopczynski and Barry, his wife Kathy and their daughter, Landyn Kopczynski. She is also survived by the dog that she loved so–Ambrose. Betty Lou’s presence will be greatly missed by family and friends. The family would like to express our appreciation to the staff of Mary Immaculate Hospital, Riverside Rehabilitation Hospital, York Convalescent Center and the crews from York County Fire Station’s 4 and 6 for their extraordinary care. Services will include visitation on Thursday March 28, 2019 from 6 pm until 8 pm at Amory Funeral Home-410 Grafton Drive, Yorktown, VA 23692 and the funeral will be at noon on Friday, March 29th at Crooks Memorial United Methodist Church, 204 Cook Road, Yorktown, VA 23690. Burial will follow at Peninsula Memorial Park. In lieu of flowers, memorials are encouraged to be made to The Hobie Kopczynski Memorial Scholarship Fund care of 200 Purgold Road Seaford, VA 23696.